OVERVIEW: When his dad's book turns out to contain deadly secrets, twelve-year-old Furious Jones is thrust into a web of mystery and danger in this gripping page-turner. Furious Jones, the twelve-year-old son of a famous thriller writer, lives with his grandfather after his mother was mysteriously gunned down right in front of him a year ago. Curious to know more about his estranged dad, he goes to see him speak about his upcoming novel to a packed audience - and to his shock and horror, he witnesses his father get shot as well. When Furious discovers that his dad's upcoming novel contains dangerous and fiercely protected secrets, he sets out to discover who killed his father, and what exactly they were trying to cover up. Ideal for fans of Alex Rider and Theodore Boone, the action-packed exploits of Furious Jones are as thrilling as they are intriguing. Can Furious unravel this literary mystery before the death toll rises? FORMAT: Furious Jones and the Assassin's Secret is a children's/YA murder mystery, spy espionage, adventure novel. It stands at 336 pages and was published on April 8, 2014 by Simon & Schuster Books for Young Readers. ANALYSIS: When it comes to mysteries and thrillers, there doesn't seem to be a huge transitional series of books available for that older middle school student. There are the cutesy mysteries that involve the haunted houses and lost pets, which are geared to the younger audiences, and then there are the adult thrillers with blood, guts and gore. There isn't really something out there for that older middle school reader who is tired of looking for lost cats but isn't totally ready to read details about murders, sexual assaults, and other non-age appropriate matters. Now enters Furious Jones. Furious Jones is a combination of spy espionage, murder mystery, and adventure all rolled into one extremely quick read. It has all the elements the older middle school student population is looking for in a book without watering it down or going overboard with things. It is fast paced, the conversations are realistic, and the characters believable. There was a bit of a predictable, easy to solve element to the plot, but I think only people who read multiple murder mysteries would have been able to pick this element out. The fast paced nature of the book makes up for it because before you know you know what might be happening, the book is almost over. Another element that really sticks out is the main character Furious does a lot of things that a normal teen probably wouldn't be able to do. He runs around a bit reckless and just randomly joins a high school, which is a tad bit unbelievable. It is brushed off as him being tall or him being older looking, but I just found some of these elements so unbelievable. However, I think the book's target age wouldn't really think twice about it. There are a few moments throughout the book that the gore level is amped up a little. For example, there is a death that involves a body being chopped up and put in hale bales where all you see is the eyes. It is this factor that makes me reluctant to recommend it to the younger audience (which it is marketed to), as it does have some semi-graphic content. However, I do think boys in particular will enjoy it. 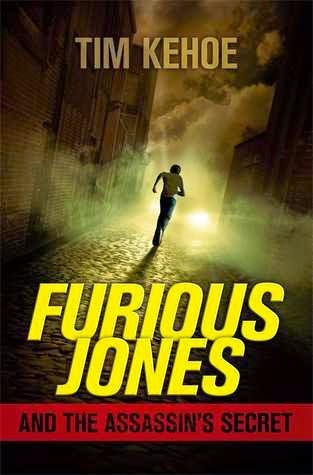 It should be noted that Furious Jones was supposed to be a series, but due to the unfortunate passing of the author the series will not be completed. But that shouldn't keep you from reading the book. The entire plot is wrapped up nicely. There were no major cliffhangers involved, which makes it a fairly good standalone novel. I would love to see more novels of this sort enter the market. There is such a huge focus on either supernatural elements or dystopian that a whole potential market is left untouched. Furious Jones paves the way for that market and I look forward to seeing other authors take the plunge and challenge themselves. Obviously, Kehoe was not afraid of taking that challenge and it paid off. I'm the daughter of the author and I think this is a great review. It sums up the book wonderfully. Thank you for stopping by. It is still one of my top books and I've recommended it to people. It was an honor to read this book.